American toads have glands on their skin that produces a white toxin to protect them from predators. The toxin is only harmful if swallowed or if it gets in eyes. Any animal who eats an American Toad is likely to get very sick. 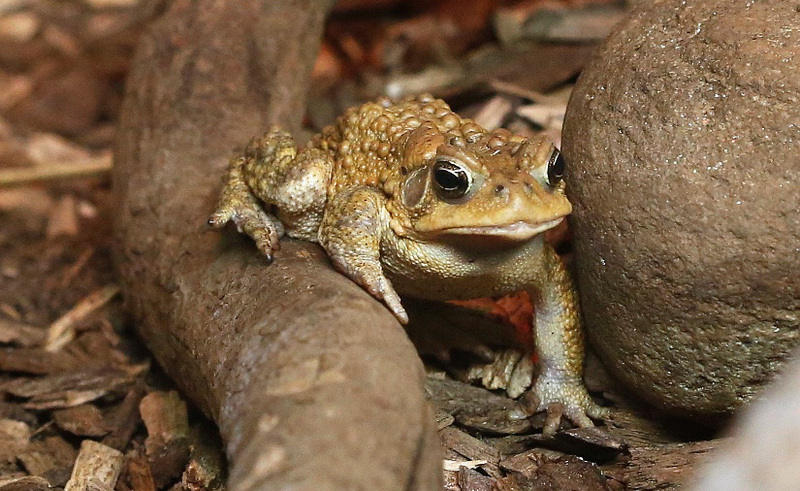 American Toads may also urinate on themselves to make them less appetizing to predators. They can also inflate their bodies with air to make it difficult for snakes to swallow them. American toads give off long trill sounds that each last between 4 and 20 seconds to communicate with each other. When they call, their throats puff out like large, inflatable balloons. American toads also use body postures, touch, and chemical cues for communicating. DESCRIPTION: American Toads are approximately 2 to 4 ½ inches in length. Depending on their environment they may be tan, brown, reddish brown or olive in color. Some are a solid color but others have a pattern of several colors. They all have a yellow or white underbelly and dark round spots on their backs that are called warts. They are not the warts that humans can sometimes get from a virus. They are just round, noticeable bumps on the toads skin. Toads all have bumpy skin. A toad’s skin can change color depending on temperature, humidity and stress. American Toads have four toes on each front leg. Each hind leg has five toes that are connected to each other via webbing. They have short legs and chubby, compact bodies. While still growing, American toads shed their skin every couple of weeks. Adults shed their skin about four times a year. The skin is collected under the tongue and swallowed. Females are larger than the males. They have lighter overall coloring and white throats. The males have dark throats. American toads can be easily distinguished from other toad species. 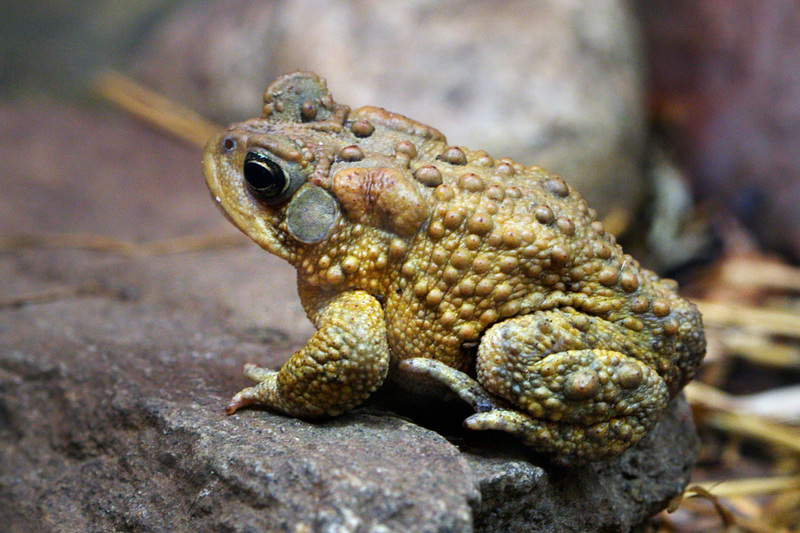 American toads will have several dark spots on their backs that contain only one or two warts. The black spots are sometimes circled in yellow. Toads are easily mistaken for frogs but there are differences. Frogs tend to have longer legs for jumping, they have smooth or slimy skin, they prefer a wet environment and they lay eggs in clusters. Toads have shorter hind legs for walking, they have bumpy skin, they prefer a dryer environment most of the time and they lay eggs in a line. RANGE: American Toads are only native to the Nearctic region but they are found throughout North America north of the southern United States. They are the most widespread toad species in North America. HABITAT: They require a semi-permanent freshwater pond for breeding and early development. They live the rest of their lives in dense vegetation. They can survive wherever there is a good supply of insects for food. They seek shade during daylight hours and they are mainly nocturnal. They hibernate in winter by digging backward deeper into their summer homes. DIET: Adult American Toads are carnivores – they eat mainly insects but they will also eat spiders, worms, slug and other invertebrates. They can eat up to 1,000 insects a day. Tadpoles are considered herbivores since they eat aquatic plants and algae. American Toads do not drink water. They absorb moisture through their skin. FAMILY LIFE: American Toads lay 4000 to 8000 eggs that are black on top and white on the bottom. The eggs are in two long strings of a clear sticky gel. Once the eggs are laid the parents go their separate ways and the eggs and young are on their own. The larvae that hatch from the eggs in 3 to 12 days are called tadpoles. Tadpoles are almost black and they have gills and the same toxin that the adults have to protect themselves. They usually group together to feed for between 40 and 70 days. Their hind legs start to form at 20 days. The front legs emerge at around 35 days. When the front legs appear the gills disappear and they start to breathe air above water. In the last 2 or 3 days of transformation their tails get reabsorbed into their bodies. They will then stop eating plants and start eating insects. LIFE SPAN: One or two years in the wild. In human care they have been known to live over 10 years.